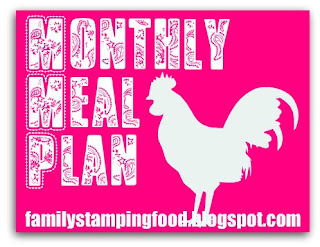 I've been planning our monthly meal plans for over a year now. I cannot tell you how much easier life flows when you have just one small detailed ironed out, like "what's for dinner". We eat out a lot less, saving quite a bit of money (money we didn't have anyway). We eat a lot less junk food (which we don't need anyway). Last month we picked up on the cheap sweet potatoes ($.35/lb at Food Depot). I'll probably pick up a few more pounds to puree and freeze in 2 cup portions. We also got a free turkey from Kevin's work and I bought one at Publix for $.59/lb. We might have a few changes along the way, but here's the game plan. We have a few new recipes to try this month. Some things I made quite a lot, but have never documented for Sissy's recipe blog. I'll be blogging those recipes over there. The ones that are successful, will make their way to her blog as well. As for the freezer cooking this month, I've sort of been working on it a little this week. Cinnamon Banana French Toast Sticks - the kids gobbled them up fast! They really loved them and so did I! I admire you and your monthly cooking and meal plans, I really do! When I try to do it that much, I deviate. Two weeks works well for me though. Looks like it's going to be a great month of eats in your household though! Stop by my place to enter my cookbook giveaway when you get a chance! All the best to you! Your meal plan looks great. I agree it's easier when you know what you are eating each day.